President Donald Trump declaring victory after Attorney General William Barr released the main findings of the Special Counsel’s Russia election investigation. There’s now a growing call for the Attorney General to make all of the report public. President Donald Trump declaring victory after Attorney General William Barr released the main findings of the Special Counsel’s Russia election investigation. There’s now a growing call for the Attorney General to make all of the report public, as nearly 20 State Attorney Generals are calling for the full report. On March 24, Barr released a four page summary of the nearly two-year investigation, saying the Special Counsel’s investigation found no conspiracy between Russia and the Trump campaign during the 2016 Presidential election. Mueller delivered the report to Barr on March 22. Michigan Senator Gary Peters and Michigan Congresswoman Elissa Slotkin are calling for the same thing. The Democrats want the release of the full report as quickly as possible. Barr’s summary says Mueller did not draw a conclusion one way or another on obstruction. Based on that, Barr and Attorney General Rod Rosenstein decided on the evidence collected by Mueller there’s no proof the President committed the crime of obstruction. 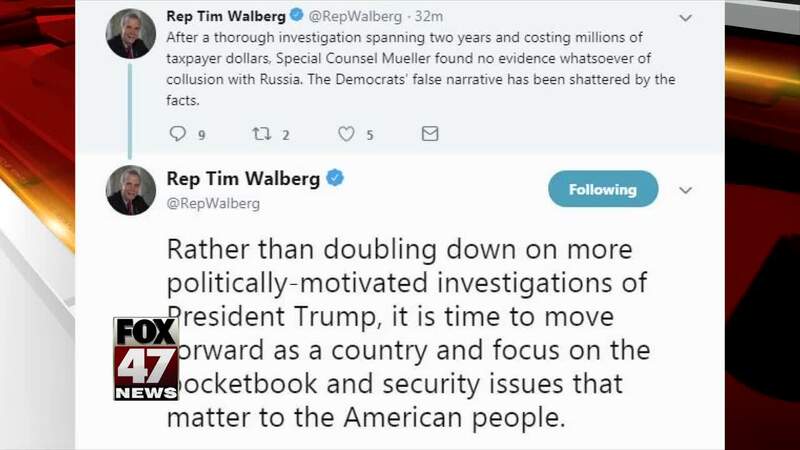 Democrats now say just because the Mueller investigation is over, they now leading several congressional investigation and there are also ongoing state and federal probes that may involve the president and his family.